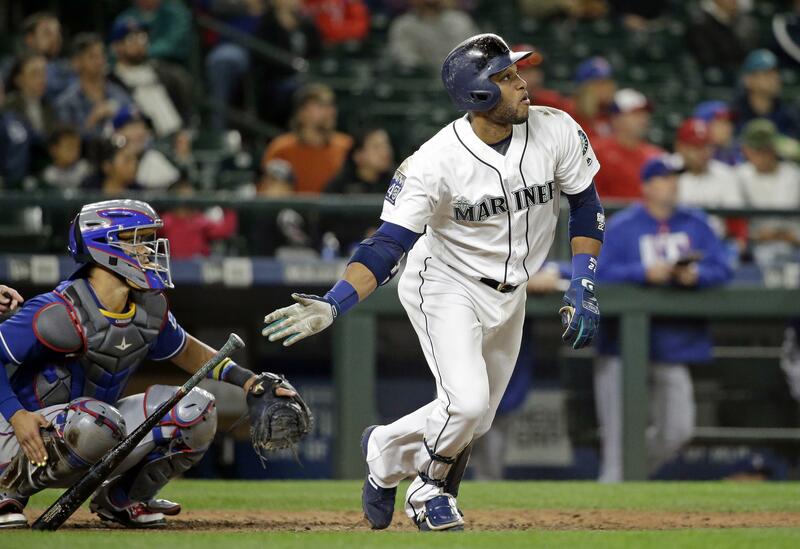 UPDATED: Thu., Sept. 28, 2017, 5:38 p.m.
ANAHEIM, Calif. — It was four years ago when, seeking to jolt the franchise out of its extended doldrums, the Mariners shocked the baseball world by shelling out $240 million to sign second baseman Robinson Cano to a 10-year deal. Numerous club officials admitted privately at the time that such a contract made little financial sense in strict baseball terms. While Cano was then undeniably one of the game’s premier players, he had just turned 31. The Mariners were hoping for four-to-five years of peak performance before age began to erode (gradually they hoped) his skills. The massive deal only made sense when linked to a franchise reset with its waning fan base and within the industry. The Mariners wanted everyone to know they were committed to winning. Signing Cano was a statement. Results to date have been mixed but generally disappointing. Cano has been an All-Star in three of his four seasons in Seattle. It’s also unlikely Nelson Cruz would have signed a year later as a free agent if not for the franchise commitment shown in signing Cano. The Mariners, after perennially slogging through the season’s closing weeks, played meaningful games in September in three of the last four years. They twice went to the season’s final weekend before getting eliminated from postseason contention. But their postseason drought is now up to 16 years. All 29 other clubs have experienced postseason since the Mariners’ magical 2001 run ended in a disappointing loss to the New York Yankees in the American League Championship Series. It’s time for the Mariners to make another offseason splash. It isn’t hard to identify what drove the dagger into the Mariners’ latest postseason aspirations. Six losses in September to Houston, a pair of three-game sweeps, stripped the Mariners of any momentum. The Mariners were on a 26-17 run following the All-Star break before they suffered a three-game sweep to Houston from Sept. 4-6 at Safeco Field. That started them on a 7-13 collapse. The Astros did it to everyone. They ran away with the American League West Division pennant, and they represent the biggest short-term hurdle the Mariners face as they turn their attention to the future. The Astros are simply better than the Mariners. It isn’t just the standings. The Astros are far better head-to-head. They finished with a 14-5 edge in the season series and hold a 37-20 advantage over the last three seasons. The Astros are younger than the Mariners. The Mariners’ average age this season is 29.7 years with several of their core players in their 30s. The Astros’ average age is 28.9 with their many of their top players in their 20s. The Astros have a far better farm system than the Mariners. Houston ranks fifth in Baseball America’s organizational talent rankings. The Mariners are 23rd. The Astros have five of the game’s top 60 prospects. The Mariners have none. It isn’t just the Astros either. Texas and the Los Angeles Angels are in the process of turning over veteran rosters and have shown a willingness to spend in order to win. Oakland faces severe financial challenges but has nonetheless assembled a deep group of talented youngsters. Kansas City and Pittsburgh each proved in recent years that such an approach can yield big dividends before financial realities hit. Bottom line: The A.L. West already has an emerging bully in Houston, and the Mariners’ three other division opponents each show signs of improvement. It’s an arms race that can’t be ignored. The Mariners recognize all of this, and they’ve taken steps over the last two seasons under general manager Jerry Dipoto to transform their roster into a younger, more athletic collection. “Look around our diamond,” Dipoto said. “Our catcher (Mike Zunino) is 26. Our shortstop (Jean Segura) is 27. Our third baseman (Kyle Seager) is 29. Our outfielders (Mitch Haniger, Ben Gamel and Guillermo Heredia) are all 25 or 26. The pitching staff offers a similar story. While Felix Hernandez is an old 31 (in terms of mileage), the remaining rotation candidates are younger than 30: Mike Leake is 29, James Paxton and Ariel Miranda are 28, Erasmo Ramirez is 27, Marco Gonzales is 25 and Andrew Moore is 23. Lefty relief specialist Marc Rzepczynski is 31, and setup man Nick Vincent is 30. But closer Edwin Diaz is 23. Emilio Pagan, James Pazos and Shae Simmons are 26. Dan Altavilla is 24. Prospects Thyago Vieira and Max Povse are 23. Club officials believe their roster overhaul/upgrade gets overlooked because they are closing out a disappointing season, which stemmed from an abnormal number of injuries to their rotation and other key players. If so, it only underscores the Mariners’ need to make an impact move, maybe two, to bridge the gap to the Astros while separating themselves from other division opponents. Just getting healthy with the same group won’t cut it. The obvious offseason target is Japanese two-way star Shohei Otani, who is expected to be posted for MLB consideration in coming weeks by the Nippon Ham Fighters of the Pacific League. Otani is 23, which means he is subject to the international spending limits, which effectively eliminates a bidding war. The Mariners plan to make a strong push. Early indications suggest Otani will make a decision prior to the Winter Meetings. Whatever happens with Otani, the Mariners’ primary offseason needs are to acquire an impact starting pitcher, a first baseman and a center fielder. They could pursue a corner outfielder if they choose to move Haniger to center. Trades are possible and have been Dipoto’s preferred player-acquisition approach, but the Mariners’ thin farm system makes any impact addition difficult to obtain without significantly weakening another area. That seems likely to point Dipoto and his lieutenants back toward the free-agent market, which will test ownership’s willingness to write a check. And how big of a check. The offseason roster turnover projects to free roughly $20 million in payroll once guaranteed increases for Seager and Segura are computed along with projected pay hikes for a handful of arbitration cases. Further relief is on the horizon. Cruz’s contract runs one more year at $14 million, and Hernandez’s deal runs two more years for a guaranteed $53 million. Neither is well positioned for a significant new contract. Hernandez’s form dipped significantly over the last three seasons, and while Cruz remains one of the game’s premier sluggers, any new deal will start with his age-39 season. Signing an impact free agent will be costly, but big deals in recent years for Hernandez, Cano, Cruz, Seager and Segura suggest the Mariners are willing to spend money on what they view as reliable assets. So who’s available on the free-agent market? The big splash for the rotation would be Yu Darvish, whom the Mariners know well from his time in Texas. Other high-impact possibilities are Jake Arrieta and Masahiro Tanaka. Signing Darvish or Tanaka could aid the Mariners in recruiting Otani, although getting either one signed – even assuming mutual interest develops – prior to Otani making a decision seems a long shot. More-likely rotation targets include Alex Cobb or Lance Lynn. The market is loaded with first basemen, including the Mariners’ current duo of Yonder Alonso and Danny Valencia. The big name is Eric Hosmer, but the Yankees and Boston are expected to pursue him which, if so, could quickly escalate into a bidding war. The more likely possibilities for the Mariners are Lucas Duda or Mitch Moreland. Signing Duda, Moreland or someone similar would seem to represent a space-holder move for Evan White, the club’s first-round pick this year in the MLB Draft. Club officials expect White to move quickly through their system. The Mariners could choose to fill their need for a center fielder by retaining free agent Jarrod Dyson, who could again form an effective platoon tandem with Guillermo Heredia. That would be a relatively low-cost option but would represent a nod toward maintenance rather than an upgrade. That, too, though, could be a space-holder move for outfielder Kyle Lewis, the organization’s top prospect. If the Mariners choose to pursue a marquee outfielder, the best available free-agent center fielder is Dyson’s old teammate in Kansas City: Lorenzo Cain, who figures to draw heavy interest. Possibilities widen if the Mariners shift Haniger to center field on a full- or part-time basis. The top available free-agent corner outfielders are J.D. Martinez, Jay Bruce and possibly Justin Upton (if he opts out of his current contract). None of those seems likely. Winning the Otani sweepstakes could solve the problem because, in addition to being viewed as a top rotation arm, he has limited experience in the outfield and could play there occasionally until becoming a DH possibility once Cruz departs. Signing Otani would check most of the Mariners’ offseason boxes. Swing and miss on Otani, and Dipoto’s offseason task becomes significantly more challenging. Because the Mariners need to make another splash. A big one. Published: Sept. 28, 2017, 5:36 p.m. Updated: Sept. 28, 2017, 5:38 p.m.